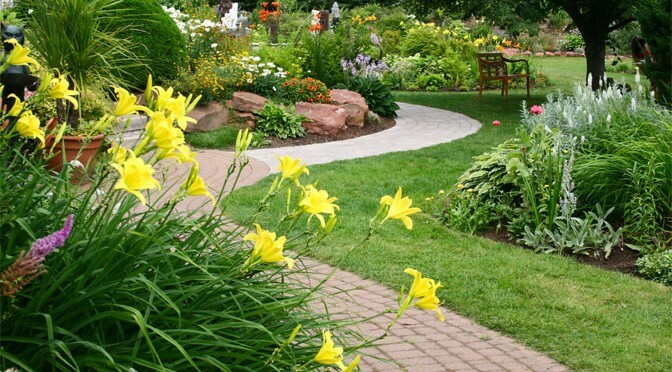 Landscaping your home is a wise investment for today’s homeowners. For over 40 years we have taken pride helping our community invest and improve. To assure the highest quality, we grow and maintain one of the largest selections of plant material in the area. Our experience ranges from residential gardens to complete site developments. Working with our staff, you can be certain your project will be customized to meet your needs. A plan from the Salt Box Nursery can help avoid landscape blunders. Consider your site, with emphasis on sun (or lack of), soil conditions, and water (drainage too), these factors will determine how your landscape develops over the years. Where is sunniest? Where is it shady? Do some areas have sun in the morning and shade in the afternoon? You don’t want to plant sun loving plants in the shade. That low wet spot in your yard is not a good situation for growing an evergreen hedge. We’ll work with you to design plantings, walkways, patios, decks, lawn areas, irrigation systems, and night lighting. We look forward to working with you to design, estimate, and construct your next outdoor living space.